Not quite sure what to do with this, but I looted it from a shrine during the Broken Shore intro experience. This item is looted from the Broken Shore scenario in Stage 6, it is looted from "Ashes of a Fallen Crusader" (coords 42,42) on an altar. It unlocks a new dialogue option with Alaina Hearthsong, in which she mourns her dead husband Cedric. She will be located in Eastvale Logging Camp (coords 85,69), after you have completed the scenario. Leaving the area and coming back will cause Alaina Hearthsong to be gone and Alaina's Bonnet will be in the bedroom, right next to her dead body. This item is looted from the Broken Shore scenario in Stage 6, from "Ashes of a Fallen Crusader" on an altar. I found it at (42,42) near the dreadlords. Once the item is looted, go back to Elwynn Forest and meet Alaina located in the biggest house in Eastvale Logging Camp (85.5, 69.7). Talk to the NPC and give her the locket via the dialog option that appears after interacting with her. Once done, leave the area and go back to the house. At this stage, she will be gone from the house and the item Alaina's Bonnet can be looted from the Alaina's belongings from her bedroom. You can find Alaina Heartsong in the Stormwind harbor right before you take the ship to the Broken Isle scenario. She is there with her two children to see their father going off to war vs the Legion. Ella says; Mommy, is daddy coming home soon? Alaina Heartsong says; Yes, baby, he'll be home before you know it. Sam says; I'll protect you Ella! I've got a sword and everything! Alaina Heartsong says; Sam! Where did you get that stick? Put it down, it's dirty. Note, that if your scenario goes to stage 7, you can still go and loot the locket at the altar. 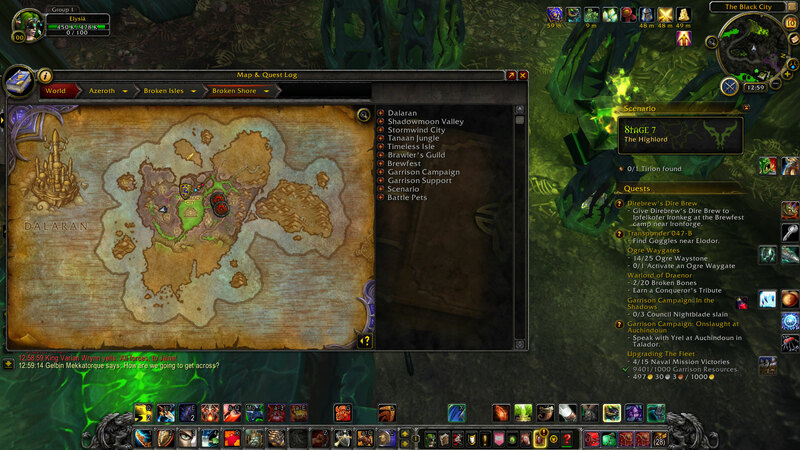 Here is a few screenshots of the location of the Ashes as I did not have a coordinate addon handy! Enjoy! The Charred Locket is tradable/sellable, BUT you can only loot it once per character. Even if you drop out of the scenario after looting it, hence by not completing the scenario and trade/sell it. 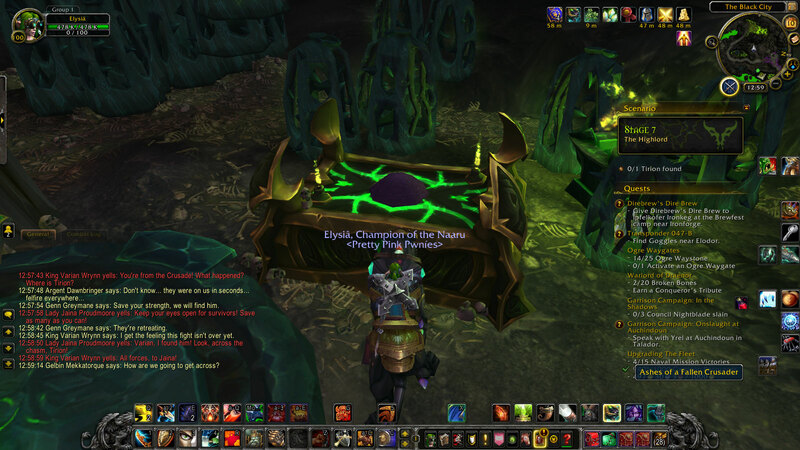 The next time in the Broken Shore scenario, the altar will be empty that character. Upon talking to Alaina Hearthsong, you give the locket to her, so you can't progress further towards looting Alaina's belongings on the 2nd floor without loosing the locket. Even though the Alaina's Bonnet gets it's own spot in the appearance tab, the visual has a "remarkable resemblance" to the Shadow Council Cowl. FYI - this item is available after Stage 6 as well. You simply can run back and pick it up at 42,42 - tends to be easier if you are with a large group than Stage 6 which tends to be shorter. Also - there weren't demons around when I grabbed it, so another benefit to waiting until Stage 7. Alaina is in the two story house to the right of the stables. stupid question but curious, is this locket available to horde? So... dad goes to fight in a war and doesn't come home. We find mom dead in her bed, the kids go missing and we steal her bonnet. Nice gadget, but my real question is who figured it out and how the hack do you guess things like this. Nor the Locket nor she give's any clue ? So, will you be able to turn this item in after Prepatch or will it be grey when Legion hits? Man, after turning in the locket and see the result, I feel like a home wrecker. Just to confirm the details. I flew into Duskwood to "make sure (I left) the area". Once you go back to the house, go upstairs where her bedroom is. In front of the bed is a 'clickable' (nice word for our US chums) box. The hat's in there. this is total BS im all Horde so im just screwed on this? You would think they could have written this with a little more sensibility to the issue of suicide. At least spawn a neutral NPC to say something like, "Don't blame yourself and I'll make sure the children are looked after." or she doesn't kill herself and abandon her children (sadly, I know that happens all too often) but gives you the bonnet because she can't bear the sentimental memory of it, etc. Does anyone know of other hidden "easter-eggs" like this? So I bought this on an alliance Demon Hunter since I play horde but she isn't in her house for me.. so guess DH's cant do this? Whilst there, remember to read the book Lethargy of the Orcs (part of the Well Read achievement). It's on the table outside her bedroom. Handily, there are also all the books from Stormwind Library also available to read from a tent on the harbour at the start of the Broken Isles Scenario. This can still be looted in Stage 7, in fact it's easier as the phase starts close by the alter and you don't have to kill anything to get to it. While the item can only be obtained and turned it by alliance the helmet reward can be transmogified by horde characters as well once obtained. I went to loot it during Stage 6, which completed before I got to the locket. Happily, in Stage 7 the mobs are gone and the pile of ash/locket is still there and still lootable. So rather than battle your way to the locket in Stage 6 you can just walk right up to it in Stage 7. WARNING: If you use a character level boost, you will be automatically flagged as having completed the scenario and you cannot go get the locket. I boosted an alt to 110 and found out the hard way. Is there anyway to do this scenario if you are lvl 120? If it helps someone :) I was worried I'd miss it, as the map doesn't update as you're doing the scenario so you can easily find your place and coords. So when stage 7 came (after the demons retreat and you've been killing mobs/saving npcs), I was running around quickly trying to work out where this was. Luckily had tomtom and handynotes addons, so ctrl+clicked the map of 42,42 even tho the map was undiscovered and I wasn't on it as such. It gave me way points. "The inscription inside is illegible."